Saxony tweed 100% pure wool, laminated to make these items fully waterproof, with leather trim. The Helmsley Tweed Carryall is available in two sizes and has a good-sized main compartment, a full-width rear pocket and two leather-trimmed pockets on the front with flap closure. The cotton webbing shoulder strap is fully adjustable and a comfortable 2 wide. Access to the bag is through either the solid brass buckles or the quick-release brass studs. Available in two colours Burgundy or Green. Medium: 13½" x 10" x 3½"
Large: 15½" x 11" x 4½"
The Helmsley Netted Carryall has a good-sized main compartment, a full-width rear pocket and a large netted pocket on the front. The cotton webbing shoulder strap is fully adjustable and is a comfortable 2 wide. Access to the bag is through either the solid brass buckles or the quick-release brass studs. Available in two colours Burgundy and Green. 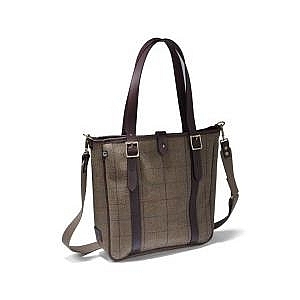 Size: 15½" x 11" x 4½"
The Helmsley Twee Tote Bag is a classic shopper-style bag. The leather handles can be set to carry over the shoulder or by hand. The detachable webbing sling also gives the shoulder option. Medium: 12½" x 13½" x 2½"
Large: 15½" x 16½" x 3"